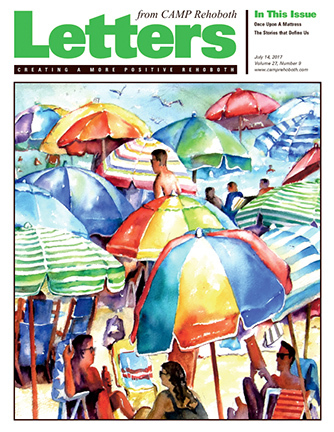 Contributing to this issue: Tony Burns, Michael Ford, Kim Butler, Tricia Massella, Fay Jacobs, Doug Yetter, Monica Parr, David Garrett, Nancy Sakaduski, Stefani Deoul, Kathy Weir, Chris Azzopardi, Dr. Michael Hurd, Glen C. Pruitt, Rich Rosendall, Terri Schlichenmeyer, and Murray Archibald. On the cover: Detail from Colorful Umbrellas #1 by Rodney Cook. New work by Rodney Cook is featured at the Back Porch Café from July 19-August 15.